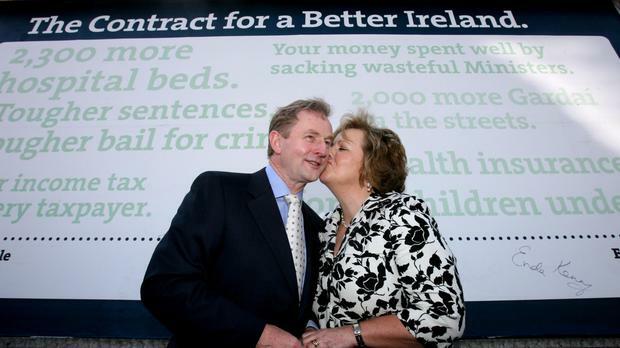 Enda Kenny with his wife Fionnuala. After leading Ireland through a monumental crisis, Enda Kenny left the stage with little drama. His own valedictory speech before parliamentarians in the Dail was brief, understated and modest. He had done his best and hoped that he had left the country in better shape, he offered it with humility. Others were left to recall the magnitude of the economic abyss the country was staring into just six years previously, when he was handed the steering wheel - albeit with a road-map imposed by international bailout masters. But typical of his style and perhaps of his Fine Gael party, it was an orderly handover without the political bloodshed that often attends a leadership heave. The fact was not lost on his chief rival and Opposition Fianna Fail leader Micheal Martin. Mr Kenny had given a "master class" in recent months in how to manoeuvre a difficult situation in a beneficial direction "at his desired pace", he told the house. "He has ensured that those who were stalking the corridors in search of journalists to brief against him have been obliged to issue lengthy statements describing him as the greatest Irishman since Brian Boru," he added to peals of laughter. "The mischievous enjoyment he has taken in this has been a genuine joy to behold." At 2pm, Mr Kenny had filed into the Dail chamber and took his seat as the leader of government for the last time. In the distinguished visitors gallery behind him was his wife Fionnuala, one of their three children Ferdia and the outgoing Taoiseach's brother Kieran. Above them, the public gallery was three quarters full. The usual prayer was offered and when the press bench prematurely took their seats before a minute's reflection, Mr Kenny authoritatively raised his hand to order them back to standing reflection. He threw his eyes to heaven. "This has never been about me," he said moments later when introduced a final time by the Ceann Comhairle, or speaker. "It has always been about the problems and challenges that the people of our country face." But this send-off was about him and Fionnuala beamed, her lips almost quivering, when Labour leader Brendan Howlin said she would be looking forward to having her husband back at home in Castlebar, Co Mayo, with her more. Along with Mr Martin, Mr Howlin - a former government partner - gifted one of the more gracious tributes. "Our central role was to fix the mess that had been created by others," he said. "As you step down today, Taoiseach, that remains, in my view, your greatest achievement and your greatest legacy, and I believe in time will be recognised as such." Mr Howlin also recalled one of Mr Kenny's undoubted career highlights, an unwavering and unprecedented attack on the Vatican over clerical child abuse cover-ups. "For a man who is sometimes derided for your folksy charms, you certainly know when to speak with impact when you choose to do so," he said. Gerry Adams took to his feet and surprised everyone. "Let me say I will miss you," he said. But just as it appeared peace had broken out between sworn enemies, the Sinn Fein leader returned to combative form. "I will miss your optimistic energy, your ability to field questions without giving the smallest clue as to your attitude to the question you were asked. "Forty years is a long time to be in the Leinster House bubble, and you have earned your time off out of this place." Others too were critical, and raised his record on austerity, women's rights and a housing crisis. But no-one doubted Mr Kenny's courtesy, his energy and his unfailing optimism. Transport Minister Shane Ross ended the eulogies insisting the country was in a much better place now than when Mr Kenny came to power. And with that, all parties rose to their feet for a sustained standing ovation. Mr Kenny turned to his finance minister Michael Noonan - a fellow veteran who is also standing down - and landed a trademark play punch to his arm, before making his way up to the gallery. As he walked out of the chamber and into a corridor leading to Government Buildings, for his last time as Taoiseach, he put his arm around Fionnuala. Only a small number of party members remained to clap them off.